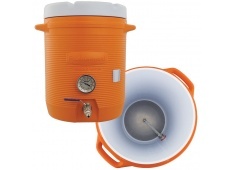 Coupon Description: MoreBeer.com currently has a coupon code that allows you to save on a 10 Gallon Mash Tun Cooler! This 10 gallon mash tun makes it east to get into all grain brewing. These coolers work very well as mash tuns, barely any temperature loss throughout your 1 hour mash. This homebrewing mash tun comes with a stainless bulkhead and ball valve, 6″ thermometer, and a 12″ stainless steel false bottom.